"...can run at any voltage!" challenge accepted. My friend has a tesla coil. I have a wifi MCU on one end and a Picaxe on the other. Trying to send ttl from wifi mcu to picaxe rs232 wired TX from wifi MCU to RX on shifter and wired RX on rs232 side to Picaxe. The TX lights on the MCU and the RX lights on the shifter but nothing is happening on the Picaxe. It should be lighting an LED. I have switched the wires every way I can think of and still nothing! Probably too late, or maybe you've figured it out already, but make sure you power this shifter with VCC matching the logic level arriving in TX-O. I had this same problem (TX LED flashes but no RS232 TX signal) with VCC=5V, and using the correct input voltage VCC=3V3 ensures proper RS232 TX operation. Without knowing more about the wifi MCI its impossible to say. 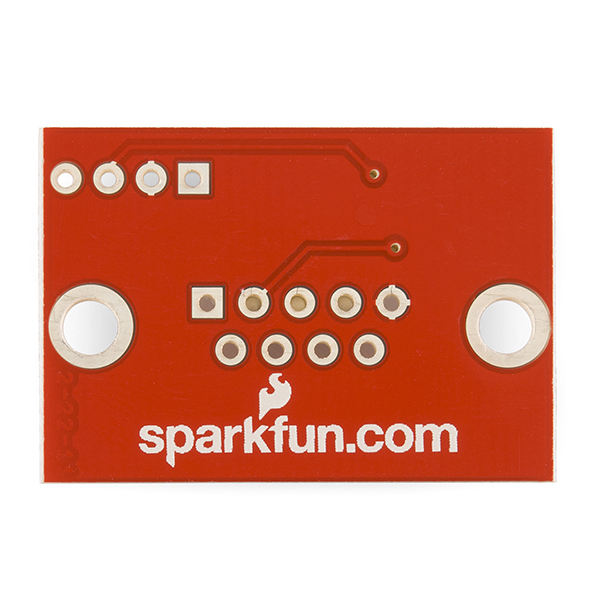 Email techsupport@sparkfun.com with more information and they should be able to help. Also, make sure that the picaxe is rs232, I'm pretty sure its ttl like most microcontorllers. Could two these be used with two of the XTend 900 1W RPSMA - 40 Mile Range to facilitate two way communication of an rs-232 setup. 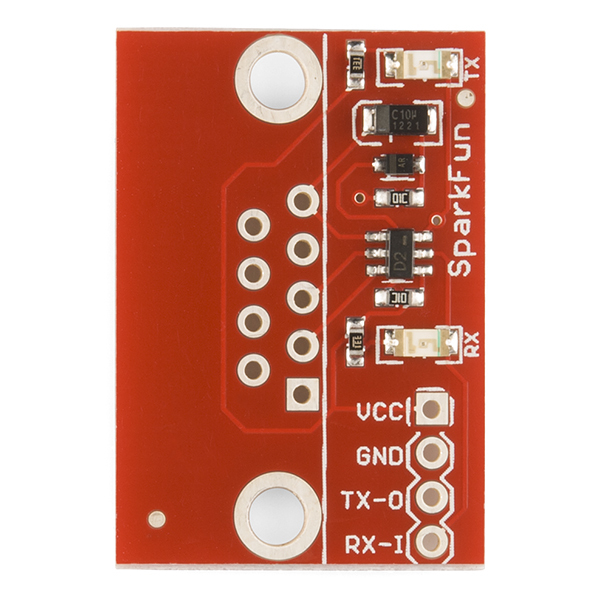 I don't think sparkfun sells the interface boards made by Digi International that would take care of the logic level conversions. Thanks! To solder this one to a Female DB9 cable: - The square pin marks Pin 1 of the cable. Most cables have pin numbers etched on the from of the connector. If yours doesn't have these markings, put the female connector behind the PCB, so the pins align. This way you can see that Pin #1 is on the upper right. To get to Pin #9 count counter-clockwise. For those looking at this for their BeagleBone Black; I can verify that this board works quite well at the 115200 baud rate used for that system. Since I have a native EIA-232 port on my mobo, I picked up one of these with a PRT-00429 and I haven't looked back. Just make sure to pick up a true pass-through DB-9 cable if you go this route. I'd like to connect a serial device that has a female plug (much like a Weather Underground station) to my Arduino. The Arduino just needs to receive data (a short burst of ASCII every minute at 9600 baud); it doesn't need to transmit. I guess I want my Arduino to be a DTE, not a DCE? 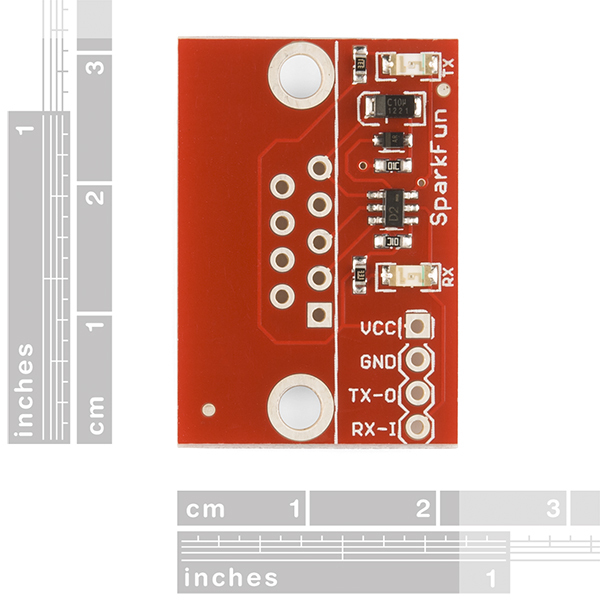 There's no male version of the DB9 component (like PRT-00429) sold to go with this board. So ... can I get a ribbon cable instead, with the DB9 connector (PRT-11156), and just solder the leads directly to this board? Which pins should I solder to which holes? Or, is this overkill, and all I need to do is make a voltage divider to step the 12v from the device down to 5v? OK, may be a silly question, but the board seems to have white paint around the pin contacts where I'd expect to see copper. Do I just ignore it and solder as normal? It vapourises?? That's actually tinned copper. It reflects rather brightly in our studio, but it's silver in real life and very easy to solder to. I would like to see a smaller version of this board. Just have the needed pins for the DB-9. Makes it more embeddable. I play with devices that put out RS-232, but DB-9 is an option. So a small rs-232/ttl converter would be great. Ok, so how does sending a transmission of a TTL get magically "boosted" up to +-12Volts RS232 on the other side when the only power supply is the TTL voltage? 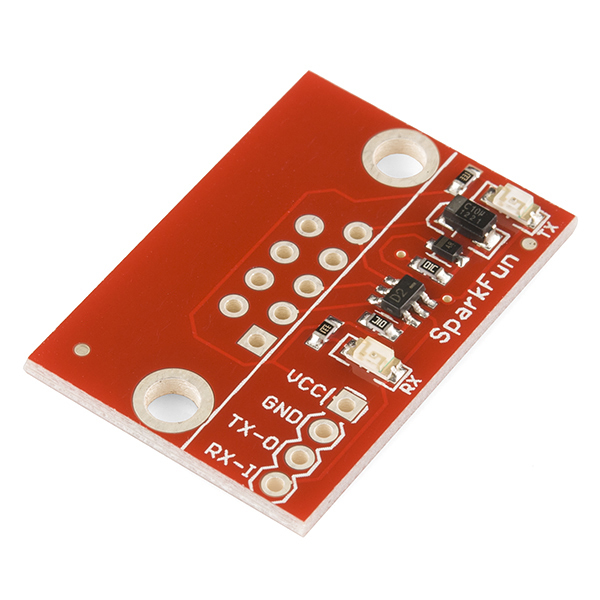 "It uses the transmitted signal input from the PC on the DE-9 connector ("RS-In" signal on the schematic) to charge a 10 uF capacitor (C1) through a diode (D1). The way it is connected, the capacitor will be charged produce a negative voltage with respect to ground. This voltage is made visible on the DE-9 transmit line ("RS-Out") through a weak (10 K ohm) pull up resistor. The PNP transistor in U1 (the transistor with its base connected to the TTL side RX-I line) overwhelms the weak pull up when RX-I is low, pulling the RS-Out line up to Vcc (+5 V, +3.3 V, or whatever the TTL side device provides). Therefore the "RS-232" outputs will range from, for a mark (1) bit, approximately 0.7 V above the negative voltage provided by the PC's output signal (0.7 V drop due to the diode forward voltage drop); and for a space (0) bit, the signal will be Vcc (5 V, 3.3 V, or whatever). I wonder if this will work reliably for 2.8 V target since RS-232 specifies that -3 V to +3 V is an invalid signal level. I have this device installed in a Motorola Micom Mobat 2ET radio, along with the Bluetooth Mate Silver WRL-12576, and the wireless serial connection is fantastic. Bidirectional data transfer is fully functional. What may not be clear to someone who cannot read a schematic, and understand the circuit, is that the TX-0 on this board connects to the RXD on the serial device while the RX-1 on this board connects to the TXD on the serial device. When properly connected, this functions perfectly. Works great, once you figure out how to hook it up! I was powering this with VCC=5v and wondering why the TX-O wasn't producing a signal on the RS232 side.. while my MCU can accept 5V signals, it only produces 3.3v logic level outputs. Switched the VCC to 3v3 and everything is working perfectly! I could receive using this board (after realizing I needed a null modem), but couldn't send signals properly. I ended up getting a MAX232 which is working perfectly -- should have gone that route all along for my project. I'm using one of the bi-directional logic converters (BOB-12009) - the lights come on for both RX & TX but no signal on the RS232 transmit when my processor sends a signal. All I can figure is the logic converter doesn't have enough power. I spent about $50 on 5 of 'em - can't get any to work. Used brand new converter and separate new power supply. Must be a bad batch. NO DOCUMENTATION ANYWHERE. A very simplified circuit schematic is not what I would consider documentation. I did eventually get it to work, but with far more difficulty than necessary. Hint: try switching the Rx and Tx lines on both the RS 232 and TTL sides, and try all combinations. Also, try assuming the pins 1-5 are swapped (5-1), as it is hard to tell which side of the board is up. But it works!! Look at the schematic before you buy this. The circuit doesn't do proper voltage conversion, it's just unreliable hack built with a couple transistors. I would strongly recommend buying the MAX3232 isntead. Neat little design, worked perfectly the first time I used it. As other reviewers have said, the TX and RX pins are from the perspective of the RS232 device, not the UART device. I'm hooking this up to a RPi3 in order to communicate with an RS232 device. On the RPi, I connected the 3.3V to Vcc, GND, UART0 TXD to TX-0 and UART0 RXD to RX-1. When sending from the RPi, the TX LED blinks, but the signal coming out on the DB9 RXD pin is only the leading edge of each bit and is only about 100mV in amplitude. I tried to connect the DB9 RXD to TXD and read off the RX-I pin, but nothing comes across. Sadly, it appears this device does not work as advertised.